Tea Party Express II Tour: IT'S OVER...for now! My patience was short with the newspaper reporter. 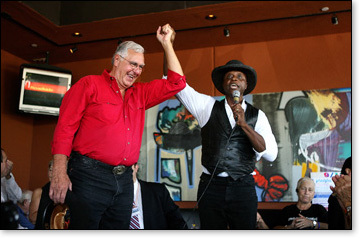 I am Lloyd Marcus, singer/songwriter, black conservative activist and participant on the national Tea Party Express II tour; 19 states; 40 rallies. At our finale rally in Orlando, Florida, a reporter approached me. She had a "these people are a bunch of nuts" attitude and smirk on her face. Though annoyed, I was polite and refused to answer her questions from a defensive point of view. Approximately 4000 patriots were in attendance. Despite numerous speakers who expressed valid disagreements with the Obama administration, like a pit bull, the reporter latched on to one questionable comment made by one speaker. What so offended me was not just this reporter, but most of the liberal biased media's campaign to portray the tea party attendees in a negative light; racists, rednecks, angry mob and just plain stupid. This arrogant reporter was the straw that broke the camel's back. I confronted her, "Why are you totally ignoring all of the legitimate concerns of the people and focusing on one comment by one person?" Not answering my question, she scribbled on her note pad. She walked away probably thinking I was a jerk or nut case, but I did not care. I took it personal her attempting to trash the people I have met across America and have come to love and respect. How dare she trash my family! Folks, the Tea Party Express II Tour was my third time traveling and participating in rallies across America. I have met and embraced the American people and they me. They call me brother because we share values. They are not racists. They are hard working decent people concerned for their families, grand children and country. Here are a few of my fondest memories. Surprisingly, most of our crowds on the Tea Party Express II Tour through small town America were a thousand plus. Our first TPX tour focused on major cities. This tour was through the heartland where diner servings were sized for Paul Bunyan. I now have a slight belly to lose. In Cheyenne, WY, I met Smokey, a fine twenty five year old truck driver. He apologized to me for the small (300 people) crowd. Smokey said his mom downloaded the poster which he copied and posted all over town. He was frustrated the crowd was not bigger. I told Smokey, he and the organizers did a great job. Cheyenne is a small town. Most folks are at work on a Tuesday morning. Those who attended were enthusiastic and grateful. I thanked Smokey for a job well done. Smokey is symbolic of the spirit and grassroots nature of the tea party movement, everyone contributing in their own way no matter how small in their eyes. The Rapid City, SD TPX II rally was held in a rodeo arena. Though the equine smell took some getting use to, our tea party team energized the crowd of 500 with an inspired and fun performance. A big tall man, six foot something wearing a straw hat, bib overalls, flannel shirt and a ZZ Top style gray beard approached me; said his name was Norwegian Jim. The gentle giant gave me a bear hug and thanked me for what I am doing for our country. Jim confided that he had a wooden leg and was due for a new one. He said, "A new leg costs $20,000. I'm a wood carver. If Obama Care passes, I may have to carve my next leg." One day on the tour was particularly difficult traveling several hours on the bus with eleven people; entertainers, speakers and a photographer. We had been traveling in very close quarters for over a week with two more weeks to go. Nerves and patience were a little thin. Embarrassingly, I will admit that even I joined the chorus of complaints. The next morning we were on the bus headed to our first rally of the day. I called the team together. "Let's have a gratitude session." Each person took a moment to express what the Tea Party Express tour means to them and why they are grateful to be a part of it. The session was incredibly powerful. Each person got a little emotional during their comments. The exercise reminded us why we were graced by God to be on the bus. We were making a difference, encouraging the American people and a part of history. We were extremely grateful. Upon arriving at the rally, we gave one of our most powerful performances. Wichita, KS — As usual, the crowd loved my performances of the "Tea Party Anthem" and "2010". Like every rally, I signed several autographs, posed for pictures and shook hands. I called the TPX II tour my "Million Handshake March." With tears in her eyes, a middle aged white woman grabbed my hand with both of hers. She pressed something in my palm. "I wish I could give more. I just want to contribute to your efforts. God bless you." With a line building behind her, without looking, I put her gift in my pocket and continued shaking hands. Then, a heavy gentleman who was missing his front teeth pulling up on his bicycle. "Mr. Marcus! I rode all the way across town to meet you. Thank you for your columns and for what you are doing for our country. I love you and I am praying for you. You're my brother." I gave my sincere white brother a hug. Later that evening, I reached into my pocket and found a five dollar bill from the tearful woman. I got the feeling her finances were challenged which made her gift special. And why did she feel the need to give me anything? It brought to mind a woman in the Bible who humbly gave her all. Thank you Five Dollar Lady, I appreciate you. A Great Day in Texas! He hated it when we called him "cheese head." Hustusa is a forty something white male who followed both of our Tea Party Express tours across America. He wore a triangle hat shaped like the cheese head hats worn by Green Bay Packer football fans. His hat read "I didn't vote for this Obamanation" on all three sides. He also carried a tall sign and sold buttons at every rally. A general contractor by trade, Hustusa said his business phone stopped ringing the day after Obama was elected. He lost his home earlier this year. In Amarillo TX, I met a feisty grandmother who is raising a little boy, not her own, on a widow's income. She was definitely not infected with the entitlement mindset being spread by liberal democrats. "I never asked nobody for a bailout! ", she proudly told me. At every rally, the crowds anticipated, loved and cheered my now famous trademark opening line, "I am not an African-American. I am Lloyd Marcus, AMERICAN!" In Beaumont, TX, a white cowboy ( tall, lean, cowboy hat, western shirt, jeans and boots) approached me pushing a stroller with two black babies. He said, "My babies are hyphenated Americans until we get their citizenship a week from today." He explained that he and his wife (also white) wanted children who really needed them. The couple believes God lead them to adopt their two black babies from Ethiopia. "Today they are Ethiopian-Americans. Next week, they will be Americans! ", proudly proclaimed the father. But how could such a "color blind" act of love happen? The Left says only racists attend the tea parties. "This movement is all about racists hating a black man in the White House", says Jeanine Garofalo. A Texas women asked me to inform America about the plight of our truckers. Her husband along with hundreds of thousands of other truckers across America have lost their jobs; hundred year old trucking companies are out of business and once thriving truck stops are half empty. Our TPX II team heard the same concerns and felt the same emotions in every town, at every rally; fear, anger and frustration. "What can we do to stop the terrible agenda of the Obama administration?" We inspired and gave them hope assuring that "We The People" can and will save the America we know and love. 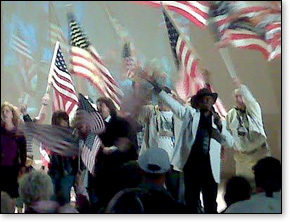 Black clergy are firing up the crowds touting the virtues of God and country at tea parties. They worship Godly principles over skin color. Based on his abortion policies alone, I am still baffled as to how a Christian could reconcile voting for Obama. I met several bright black youths who, refreshingly, were not taken in by Obama's rock star persona. One young black man who attended a tea party had just been released from prison nine days earlier. He admitted he made wrong choices and wanted to turn his life around. He was seeking truth. I gave him an autographed copy of my friend, William Owens' book, "Obama: Why Black America Should Have Doubts." William and Selena Owens are wonderful black conservative authors who traveled with me on the Tea Party Express II tour. My first book, "Confessions of a Black Conservative" will be released soon. Michelle Malkin wrote the forward. Kenneth Gladney traveled with us on the Tea Party Express bus. Kenneth is a black entrepreneur who became famous after being beaten by SEIU thugs (Service Employee International Union) for selling "Don't Tread on Me" flags at a townhall meeting. The beating sent Kenneth to the emergency room. He was simply attempting to earn a living selling flags after being laid off. Liberals are quick to put independent blacks back in their place on the government dependency plantation. On the tour, I also met young black conservatives running for political seats traditionally controlled by liberal democrats. Yes, the times, they are a changin'. No longer are blacks sheepishly and mindlessly following the leading of so called black leaders who thrive on convincing them they are victims. Interestingly, most of the blacks I chatted with at the tea parties were current or ex-military. They have lived around the world and realize America truly is "a shining city on a hill". Sorry, all you globalists, but America is peerless. We blacks are blessed to live in the greatest land of opportunity on the planet. The day the majority of black Americans realize this truth is the day they can finally say, to quote MLK, "Free at last, thank God almighty, we're free at last!" Dr. King made that statement referring to the tyranny blacks were suffering from white racism in America. He could have never imagined blacks would someday need to be freed from the tyranny of traitorous blacks and liberal whites who wish to keep them on the government plantation. Another phenomenon I noticed while on tour is all across America citizens are running for political office for the first time. Traveling on the Tea Party Express II Tour is an experience I will cherish for the rest of my life. Numerous people told us seeing our bus roll into town was extremely exciting and brought tears to their eyes. We represented hope! To pass the long hours riding on the bus, our team watched the DVD of the HBO John Adams series. Like our founding fathers, our team feels we too are patriots fighting for freedom, liberty and preserving our Constitution. My heart was stolen by the great American people. As God gives me strength, I will continue fighting for them. Stay tuned for Tea Party Express III. God Bless.